Intraarterial chemotherapy for osteosarcoma: Does the result really justify the effort? The use of multiagent chemotherapy has led to improved survival for osteosarcoma patients. Infusion of cisplatin by the intraarterial route in order to devitalize the primary tumor more effectively has been advocated in this context. 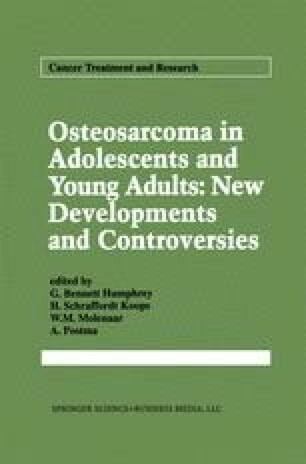 While systemic drug levels do not seem to be compromised by this regional approach, the envisioned increase in platinum content of osteosarcoma tissue has not been substantiated. As far as clinical results are concerned, neither a comparison of various protocols including cisplatin by either intraarterial or intravenous application, nor the only controlled study dealing with the subject (COSS 86), were able to demonstrate a correlation between the route of cisplatin administration and tumor response to chemotherapy. Therefore, the use of the intraarterial route for cisplatin treatment of osteosarcoma cannot be considered standard therapy but is still an investigational approach without proven benefits. In addition, the risk of side effects and the increased cost of this procedure should be considered before deciding to use intraarterial treatment for osteosarcoma.